A small group of entrepreneurial residents have got together to start a new eco-project at Collington. All of us who drink tea or coffee have the chance to recycle our old grounds and tea bags in the Collington compost project, along with fruit rinds, vegetable waste, dead plant leaves and the like. The implementing team consists of Don Peterson and an ad-hoc committee of four: Nini Almy, Liz Barbehenn, Shirley Denham and Marilyn Meek. Below are Don and Nini — two of the instigators! Without much fanfare, the group have set up a series of seven compost bins – four by the greenhouse and raised beds (pictured above), the other three at the Hilltop Gardens. Totally compostable bags are available in the greenhouse, up at the Gardens and in the Country Store. 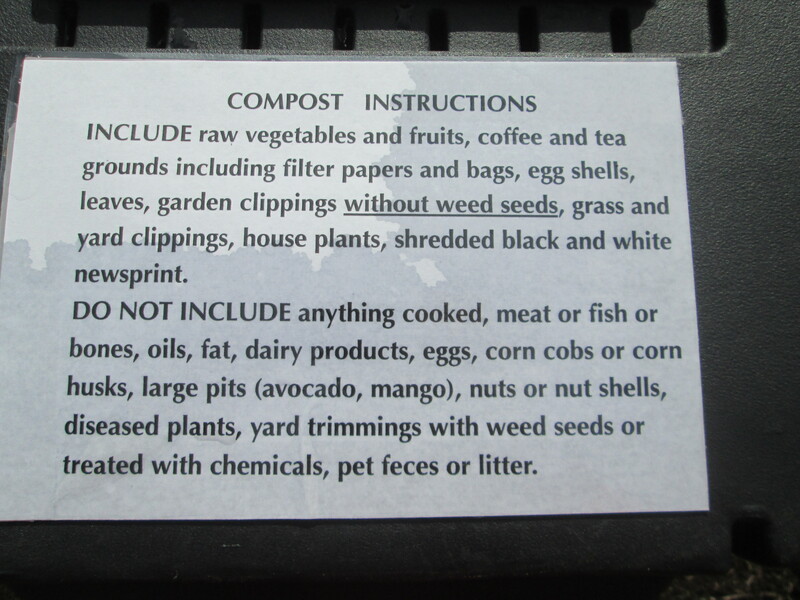 If you haven’t already started recycling, here are the compost instructions – copied on every bin. 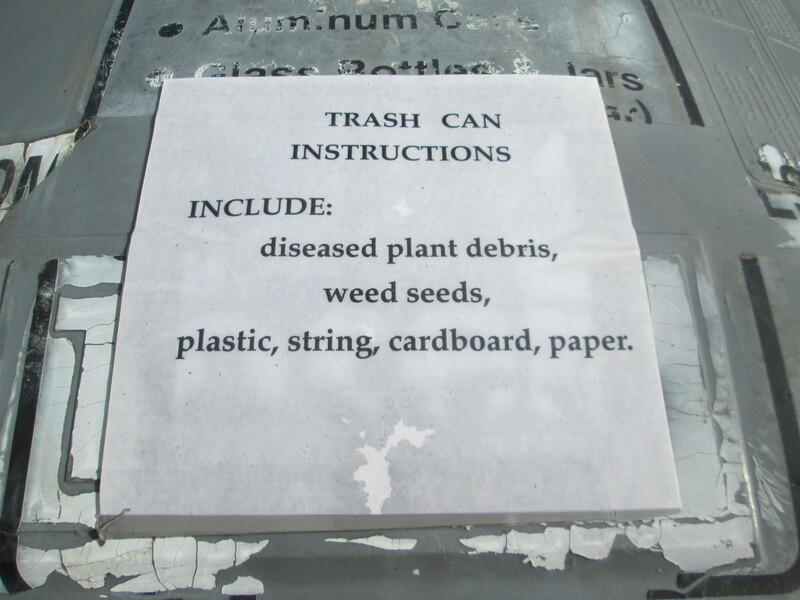 Near the compost bins is a big trash can, where you can contribute the things that should not be composted, as shown below. 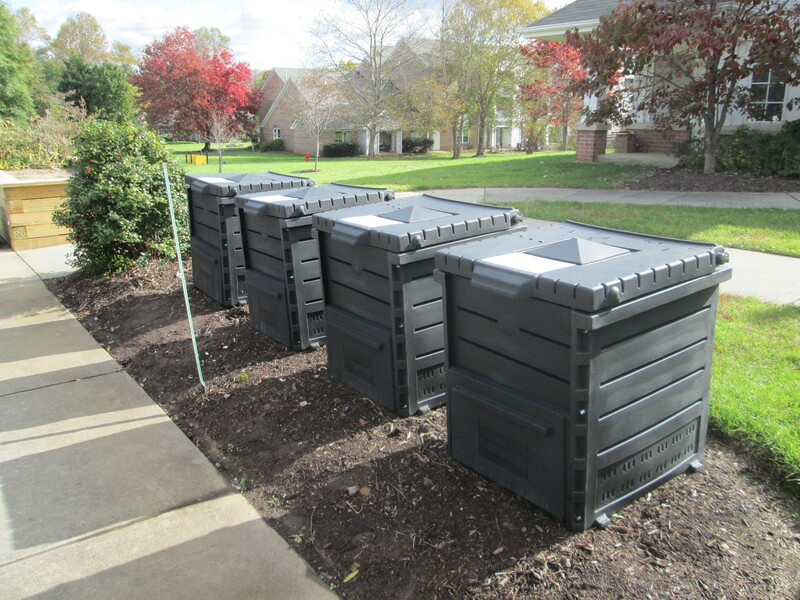 It will take about a year for the items in the bins to turn into good, rich, compost that Collington gardeners can use in 2019 to improve the soil in which they will be growing their herbs, vegetables and flowers. What a win-win project! Posted on November 14, 2018 by jbfreeman40 Comments Off on Composting! A new green venture on campus! This entry was posted in Activism, Campus, Garden Committee, Sustainability. Bookmark the permalink.